Entertainment Weekly just posted the new cover art for Melissa de la Cruz's new book! After tackling vampires and hell hounds, Melissa de la Cruz is ready to get witchy. 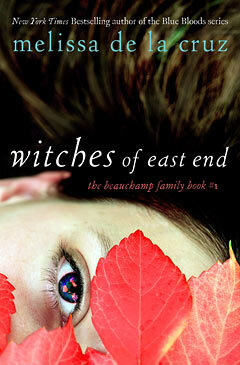 The author of the popular YA series Blue Bloods is releasing the first book in a new series, this time for adults, called Witches of East End. Centering around the magically inclined Beauchamp family, the series will take place in the same universe as de la Cruz’s previous books, and readers can expect some of her bloodsucking characters to make an appearance. “It’ll be more than a cameo,” de la Cruz told EW. “They are a little more integral to the plot than just coming by and saying, ‘Hi!’ They actually become suspects in the book’s mystery.” Witches of East End hits stores in June. She has the best luck with cover art! I've asked her before and yes, she does have a say on what goes to print. I hope the same is true for her new adult series. I'm not going to lie, I think this looks a lot like my 12-year-old daughter. This is going high on my TBR pile! What do you guys think?